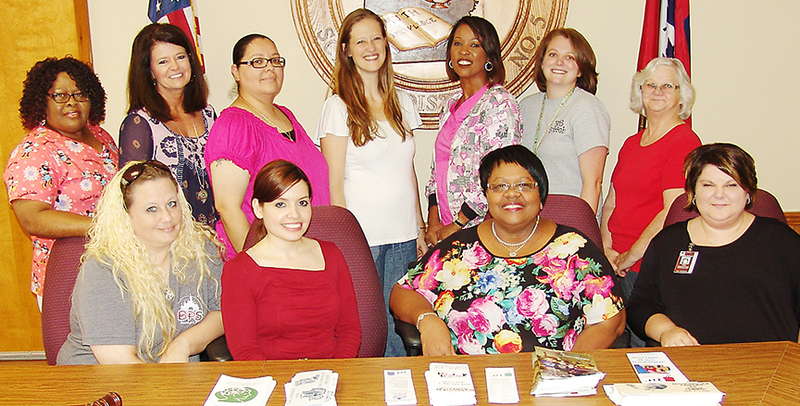 Members of the Blytheville School District’s Child Find Committee include (front, from left) Kristy Clark, Joanna Mier, committee leader Jean Cole, Amy Harmon, (standing, from left) Jeanette Nolden, Renee Craid, Julie Ponce, Allison Turner, Rhonda Hodges, Melissa Moriarty, Reyna Cunningham, (not pictured) Shirley Byrd, Chandlor Sullivan, Michelle Hardy, Christie Kennedy, Patricia Smith, Jan Wilkins and Pat Green. The start of the 2016-17 school year for the Blytheville School District has been quite successful and positive for everyone involved, including students, parents and teachers. Jean Cole, who heads up the district’s Child Find Committee, is expecting results that are just as productive as committee members begin their work. The individuals who make up the committee may change from year to year, but the committee’s focus is constant - to find all children in the Blytheville area who may be in need of special services and can benefit from those services offered by the district. The purpose of the committee is to ensure that all children with disabilities who are in need of special education and related services are located, identified, evaluated and provided with the free and appropriate services. Among the work accomplished by the committee members is the distribution of pamphlets and posters promoting the schools’ special services, and how the child’s overall social and educational opportunities can be improved by taking advantage of the services. Members of the 2016-17 Child Find Committee include Cole, director of Special Services/Behavior-Discipline;Renee Craig, Itinerant Speech pathologist; Melissa Moriarty, Speech pathologist; Shirley Byrd, district social worker; Chandlor Sullivan, district nurse at BHS/RN supervisor; Rhonda Hodges, district nurse and BPS parent; Jeanette Nolden, district nurse; Michelle Hardy, due process/discipline specialist at BHS; Reyna Cunningham, due process/discipline specialist at BMS; Christie Kennedy, due process/discipline specialist at BES; Kristy Clark, due process/discipline specialist at BPS; Patricia Smith, district due process specialist; Jan Wilkins, IDEA secretary/bookkeeper; Julie Ponce, ELL tutor; Joanna Mier, ELL tutor; Allison Turner, Community Development coordinator; Amy Harmon, Special Education teacher at BMS/parent, and Pat Green, district nurse at BES. Any person who knows of a child living in the Blytheville area and may benefit from the services offered by the Child Find Committee is asked to contact Cole at 762-2053.